You can watch our event highlight video now! We also have videos taking you on a tour of the Monuments & Memorials and visiting the Giant Pandas and other residents of the National Zoo! For different perspectives, you can also check out Jennifer’s Take on the 2016 Race and Stephanie’s Review of the 2015 Event. I will admit it. I bought into the hype. I heard so many people talk about how great this race is AND its a ten mile race (I have never run a 10 mile course, but wanted to try one out) that is so popular that it has a lottery to gain entry to it. So, of course it was going to be a great race experience, right? Well, spoiler alert, this race did NOT live up to expectations, and, to be honest, that really is saying something. For those who have read my articles for a while now, you know that I am generally positive on my race experiences. But this experience left me with little to be positive about. Candace and I entered the lottery with a friend of ours (thanks Lauren for organizing the group! ), and we all got in. Jennifer and several other of our friends gained entry to the race through separate lottery entries, so we soon found ourselves with a large running group to make this a fun weekend. Having lived in Washington, D.C. for my college and law school years, I was excited to return “home” to my adopted city for a race weekend with great friends. We drove from Ohio to D.C. on Friday morning and immediately hit the high tourist locations: Arlington National Cemetery, the National Mall, Gravelly Point (more of a locals spot really, but it is awesome), the pandas at the National Zoo, and of course a night tour of the monuments. It made for a great mini-runcation weekend. As for training? This would kick off a month with a lot of race as it would be the first of 2 consecutive weekend ten mile races, then the Star Wars Dark Side Challenge, and maybe even another race later, but that is still to be determined. Because of this, my training was right where it needed to be and I was ready to go for this race. Plus, 10 milers are shorter than half marathons, so my confidence level was running pretty high. 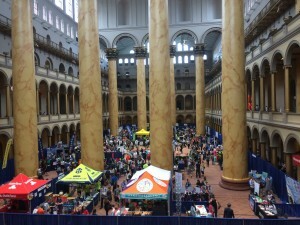 The expo is held at the National Building Museum, which is one of the most underrated treasure’s in our nation’s capital. The main atrium is truly spectacular as it is adorned with massive columns, creating a gorgeous space. Event organizers warned us that lines for packet pickup back up quickly and even tried to “assign” packet pickup times based on runners’ last names (which did not go over too well with our group). We went to packet pickup on Friday evening (at a time of our own choosing) and found there to be no lines at all. The rest of the expo was fairly standard, though there were fewer booths than I expected to see at at race of this size. We were disappointed that New Balance did not have a check in location for their NB Rewards, but were pleased to be given samples of tasty cheese and beer. I mean, you can never go wrong with cheese and beer! We were in an out in fairly short order. This race is an anti-swag event. 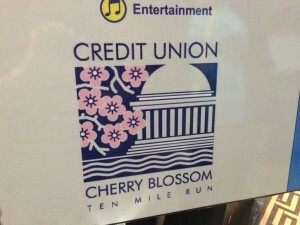 Entry comes with a standard cotton event t-shirt that you can upgrade for a fee. We opted not to upgrade, and were glad that we did not upgrade as I was not a fan of the material for the upgraded shirts. Additionally, you do not receive a medal with your entry, you have to pay for the medal, or you can pay even more for an “enhanced medal.” Supposedly this is to keep entry costs down, but I’m not a fan of this method. But more on that later. The race morning forecast told us that it was going to be 2 things, cold and windy, so I dressed accordingly. Asics full length top and running pants, Saucony windbreaker running vest, Head running gloves, Spibelt, iPhone 5S, Reebok headband, Adidas Climalite Compression Shorts, Steigen running socks, and New Balance XC700v3 Spikeless running shoes. As runners, we know that we cannot always count on perfect weather conditions on race day, and thus we need to learn to accept, adjust, and advance whenever the forecast changes for the worse. The forecast called for high wind warnings and dropping temperatures throughout Saturday night and into Sunday (race) morning. To the credit of organizers, they sent out emails advising runners of this and the changes they were implementing, such as removing signage, clocks, tents, and overhead displays such as the start and finish lines from the course as a precaution. They assured us they would do their best to keep the race going in a safe manner, and we appreciated both their efforts and the providing of updates. One email included this notice: “After you finish the race, 10 milers will receive heat blankets, water, medals and food as you head north on 15th Street, and then will be encouraged to head home. 5K finishers will receive the same amenities at the finish line of the 5K..” Ok, so they were clearly aware of the conditions, but we’ll get back to that part in a little bit. Loading into the corrals is when the race day experience began to fall apart for me. Organizers provided color coded start corrals based on everyone’s expected finish time. The problem was that access to the corrals was not limited, meaning anyone could walk into and start from any corral. Not only did I see people from the last corral in my start corral, but I saw several race bandits as well…and by several I mean there were a lot. I broke the race bandits into 2 distinct groups. 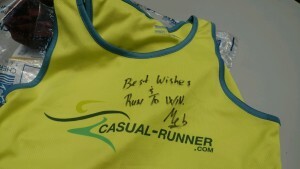 The first group simply had no bibs on at all, and noone seemed to care let alone check to exclude the bandits. The second group were wearing LAST YEAR’S BIBS! Are you kidding me? These bibs were wrinkled, thus obviously having been worn in a race before. This is what drew my attention to them. While standing in the corral I looked at several of them and noticed that they looked almost identical to this year’s bibs, the only difference being the year. That’s right, they had the same design, font, colors, and logos. I was shocked at how brazen and prevalent the bandit’ing was, and there did not appear to be any mechanism to stop it. My group of running buddies gathered in the back of our corral and were enjoying ourselves for the delayed start, when I found myself being (literally) shoved in the back. To my surprise it was a volunteer holding the barrier for the corral immediately behind us. The volunteer was prodding me move forward. Aside from the obvious inappropriateness of this tactic (at no point did the volunteer ask me to move forward), there was nowhere for me to go as the corral was packed and had not yet started moving. These are 2 big strikes against this event in my book, and the race had not even started for me yet. 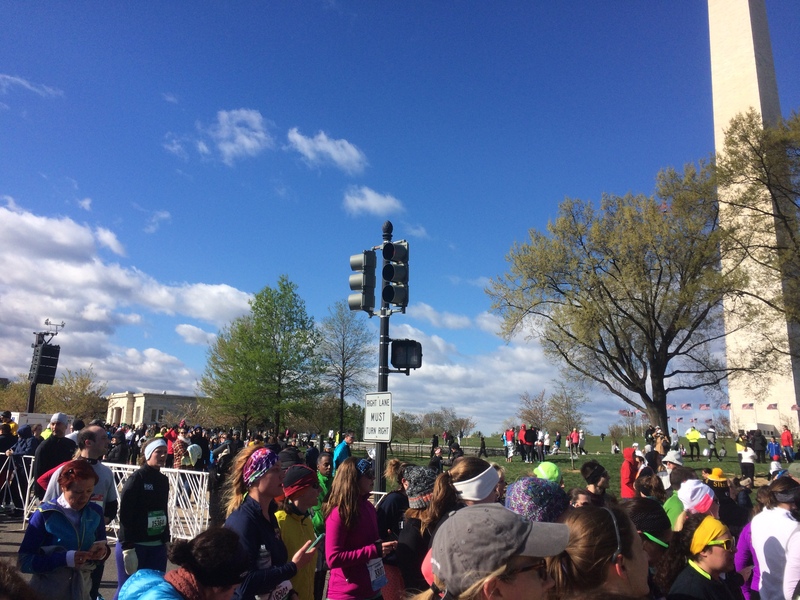 The starting corrals were immediately east of the Washington Monument. While the race used timed releases, the intervals were way too short given the number of runners (and bandits!) packed into each corral. Because of this, we would find ourselves running in uncomfortably crowded packs for much of the race that never thinned out. Everyone knows that overcrowded courses are a threat to runner safety. Unfortunately, this proved to be the case on this day. We started off south and turned right to head along the tidal basin, passing the memorials for World War II, Martin Luther King Jr., and the Korean War. This was a gorgeous stretch of course, even if the cherry blossoms were already past peak. 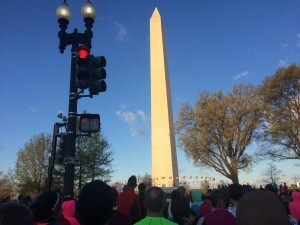 Race Icon, We turned right to head directly towards the Lincoln Memorial just as we approached the Mile 1 marker, and we saw the race leaders, including Meb!, on the far side of the road, which evoked audible excitement in the field of runners. 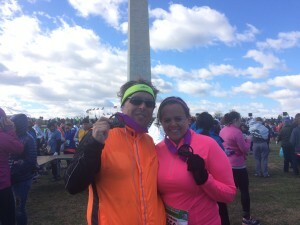 We circled passed the Lincoln Memorial and ran onto the Memorial Bridge, which should be a spectacular part of the course as you take in the vistas of the Potomac River, however my experienced was ruined. Remember how I said that the course was overly crowded and congested? Well, when that is the case, bad things happen. About halfway down the bridge, I received a jarring elbow to the shoulder as a woman passed between me and another runner. Even worse, the runner next to me was on the receiving end of an elbow to the nose. His reaction was to shout: “What the hell?”…and then some other not nice words, that, while I do not necessarily condone, were understandable after being elbowed in the nose during an unsafe pass. The offending runner turned and yelled in response: “What the F*** do you want me to do?” Um, how about not pass through spaces so small that you elbow people in the face and don’t bother to apologize? While I will not excuse her behavior, let this serve as a warning to race directors who create unnecessary course congestion with insufficient intervals between corral releases. We crossed the bridge and looped around the traffic circle in front of Arlington Cemetery to make our way back across the same bridge, affording us a gorgeous view of the memorials and downtown Washington, D.C. After the bridge we turned left to follow the river as we passed the Mile 2 marker. As we approached the Kennedy Center for the Performing Arts, we were in the left lanes and runners who had already made the next turnaround were in the lanes to our right. Both sets of lanes were heavily congested with only a small elevated curb area dividing us. Despite this, several runners hopped up on the curb to try and make their way around the heavy traffic. From where I was, I saw a runner sitting down on the curb being attended to by race medial personnel. It was obvious she had taken a nasty fall and was bleeding from her head. Despite this, I saw one runner who literally bumped her trying to get around on the curb. This is some of the worst sportsmanship I have ever seen at a race – the women was injured and receiving medical attention, and this runner bumped her trying to get around. That is inexcusable. At the turnaround (which is a sharp 180 degree turn) I was on the inside and received a shove from another runner who almost knocked me down. When I regained my footing, I noticed that he did not have a bib on, he and his running buddy were obviously race bandits. Like I said, this problem was pervasive throughout the course. We made our way south along the river back towards the Lincoln Memorial and then onto Ohio Drive, where we did yet another 180 degree turn. Again, course traffic was taking up both sides of the road in opposite directions. I found myself on the left side of the course (nearest to the traffic heading to the turnaround in the opposite direction). I was probably 2 or 3 steps off of the diving line, when I saw 3 runners approaching me, running in the opposite direction, in my lane. They yelled at me and the runners behind me to “get the hell out of our way!” and added a few other swear words. Not only was running in our lane dangerous (they were doing it to get around the heavy congestion in their lane), but the rude and nasty language was inexcusable. This many have been just my experience and others may not have seen such things, but I have never seen such terrible behavior and disrespect in a race, let alone so many occurrences of it in a single race. Again, the heavy congestion and over crowding did not do anyone any favors. We made our way along the Tidal Basin past the FDR, MLK, Jefferson, and George Mason Memorials, before heading into Potomac Park. This is a long, flat stretch along the river that lasts several miles. Unfortunately, this section quickly grows monotonous as there was zero spectator support and no entertainment (I am not sure whether this was the plan all along or the result of weather cancellations). The one awesome oasis was the group that set up at the end of Haines Point to provide runners with beer and Oreos…they deserve medals. This is a good point to remark on the insufficient placement of bathrooms along the course. Given the size of the crowd, it was surprising just how few port a potties race officials provided. Where they did provide them, they were too few and too infrequent that long lines quickly formed. Having lived in DC, I knew that there are bathrooms in Potomac Park, however they were closed for repairs. But again, no alternate bathrooms were provided. This is just another poor aspect to this event. I give credit to the volunteers who did their best to man the water stations, especially given the weather. Organizers reduced it to only 3 water stations, which I completely understand. What I do not understand is why 1 of the 3 water stations was placed after the mile 9 marker. Why would you place a water station with less than a mile to go in the race? After passing this water station we exited the park and turned right to start the gradual climb up towards the Washington Monument where the finish line awaited us. This was the best part of the whole course. Not only was the view gorgeous, but the gathered crowds were the heaviest of any point of the day (including the start) and they did their best to cheer us on. This was much appreciated. Of all of the bad aspects of this race, this next part bothered me the most because it was inexcusable. I understand that the weather conditions were less than ideal (though, being from Ohio, I have run in much worse). I know that organizers made adjustments on the fly, so things like food and water stations were being adjusted and volunteers were doing their best. But it was cold and windy, and the finish line and post-race areas are exposed to wind, which is not good when you are cold and sweaty after a 10 mile run. While organizers specifically encouraged us to grab our Heat Sheets and head home (remember? I quoted the email above? If you don’t remember, here it is again: “After you finish the race, 10 milers will receive heat blankets, water, medals and food as you head north on 15th Street, and then will be encouraged to head home.”) The problem? THERE WEREN’T ANY. Let me repeat that: organizers knew that conditions would be cold, encouraged us to grab mylar blankets as we finished, and then they ran out of them! Honestly, this is inexcusable. The official results tell me that more than 1/3 of the field finished after me, and they already ran out of mylar blankets before I finished. When you have a race has the potential to be run in cold temperatures, which this clearly did, under-ordering on the mylar blankets for runners is the wrong place to try and save a buck. 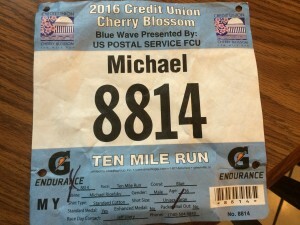 To make matters worse, as all runners were encouraged to take public transit to and from the course, we all had several block walks to get to the subway stops, and we had to do so in the cold wind without the benefit of mylar. Needless to say, from the customer service aspect, this event dropped the ball big time. 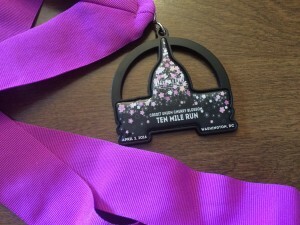 As I said earlier, you do not receive a medal with your entry, but you have to pay for the medal, or you can pay even more for an “enhanced medal.” As someone who is a big fan of bling, I of course paid to get a medal. Now, while runners often disagree as to the relative quality of the medals you receive when they are included in your race entry, I think we can all agree that, when you specifically pay to receive a medal, your expectations will go up. This medal disappointed all around. The design itself is just OK, and the lanyard is a plain purple ribbon. That’s it. Honestly, had it been included in the cost of the race entry, I would’ve been disappointed but would not have harped on it. However, since we had to pay for this SMO, I can honestly say that it was not worth it and I wish I would have saved my money. With this, like in many other aspects of this event, organizers really do need to step up their game. You cannot charge someone for a medal and then give them…well, this. We also had trouble actually finding where we should go to pick up our medals, but I will give organizers a pass on this one as I assume this was a result of taking down infrastructure and signage due to the severe overnight winds. This race meant a homecoming of sorts for me, so I made sure to include the Georgetown Alma Mater and Fight Song on my play list. Once a Hoya, always a Hoya! I think it is pretty obvious that I am not a fan of this event. While I give the organizers high marks for responding to the bad weather conditions, there were many other aspects where they simply dropped the ball, making for, and I will say it, a bad race. It starts with the corrals. They should have volunteers checking to make sure that only people assigned to the corrals enter them. This will reduce overcrowding from corral jumpers AND reduce the occurrence of race bandits, which, I like I said, was the worst I have ever seen at a race. They also need to increase the intervals between corral releases. Many of the above problems resulted from overcrowding on the course, and increasing the intervals between waves is necessary for runner safety. Speaking of runner safety, if you know that it will be cold on race day and your runners will have to walk several blocks to access public transit, running out of mylar blankets when a large percentage of the field has not even finished is inexcusable. Not to mention it is an insult to slower runners. So, will I run this race again? Most likely not. Unless and until organizers can show that they are willing to take concrete steps to put runner safety first, I will not even consider running it again. 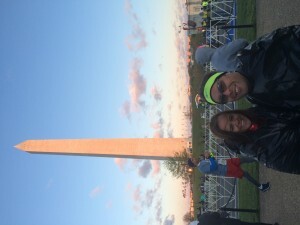 There are many other races in Washington, D.C. that offer much better race day experiences and which place a premium on runner safety.